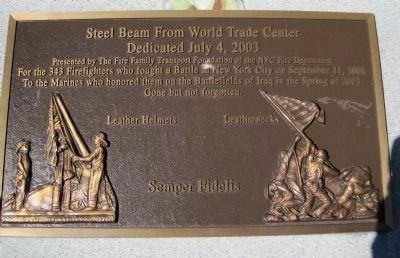 Erected 2003 by the Fire Family Transport Foundation of the NYC Fire Department. Location. 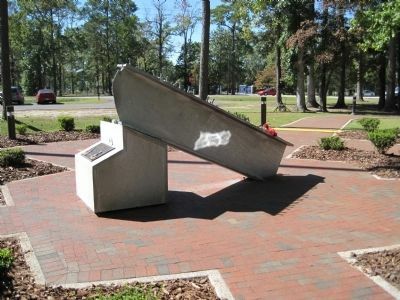 34° 44.831′ N, 77° 24.861′ W. Marker is in Jacksonville, North Carolina, in Onslow County. Marker can be reached from Montford Landing Road near Lejeune Boulevard. Touch for map. Marker is in this post office area: Jacksonville NC 28540, United States of America. Touch for directions. 700 feet away, measured in a direct line); Operation Desert Storm Memorial (approx. 1.1 miles away); Onslow Raid (approx. 1½ miles away); Edward B. Dudley (approx. 1½ miles away); New River Aviation Memorial (approx. 3.4 miles away); Camp Lejeune (was approx. 4.1 miles away but has been reported missing. ). Touch for a list and map of all markers in Jacksonville. More. 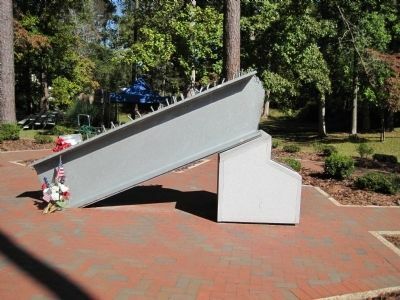 Search the internet for Onslow County 9/11 Memorial. Credits. This page was last revised on June 16, 2016. This page originally submitted on November 3, 2009, by Kevin W. of Stafford, Virginia. This page has been viewed 1,288 times since then and 5 times this year. Photos: 1, 2, 3. submitted on November 3, 2009, by Kevin W. of Stafford, Virginia.